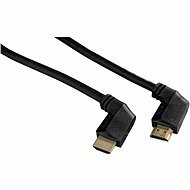 This professional HDMI cable is compatible with the HDMI 1.4 standard which, compared to the previous one, supports 3D viewing, a backup audio channel, and data transmission over Ethernet at speeds of up to 100Mbit/sec. It supports the uncompressed high-definition content at up to 4096 x 2160 pixels and supports innovative audio formats such as Dolby Digital, DTS-HD and Dolby TrueHD. The individual wires are fully shielded and have a ferrite filter, resulting in the elimination of interference. The gold-plated connectors ensure a reliable connection along with small transient resistors. 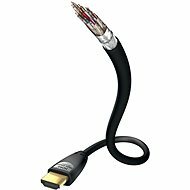 The cable is suitable for connecting a digital TV with an AV receiver, Blu-ray player or PS3 or Xbox 360 game consoles. For shipping to other EU countries visit this page HAMA ProClass HDMI High Speed (HDMI M <-> HDMI M) 3m. 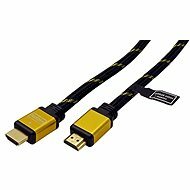 Für Versand nach Deutschland, besuchen Sie bitte ProClass HDMI High Speed Verbindung - 3m. Chcete doručit zboží do Česka? Prohlédněte si Hama ProClass HDMI High Speed propojovací - 3m. Chcete doručiť tovar na Slovensko? Prezrite si Hama ProClass HDMI High Speed prepojovací - 3m. Für Versand nach Österreich, besuchen Sie bitte ProClass HDMI High Speed Verbindung - 3m. Magyarországra történő kiszállításért tekintse meg ezt a termékoldalt: Hama ProClass HDMI High Speed összekötő - 3 m.